By: Naoise, Joe and Matthew. We are reporting from our mini scientist’s project, the members of our project were Naoise, Joe, Leo, and Matthew. Our project was about filtering water. We then thought that the regular option would be buying a filter, we then thought if there was a way to do it at home for less money and we thought of coffee paper. After that we thought of the idea of using natural resources, and decided on that. Cotton wool, which let water through, but stopped the resources shown above. Step 1: Prepare the plastic bottle by cutting it in half. 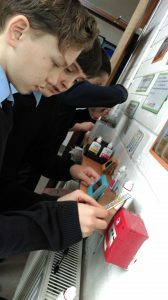 Step 2: Test tap water using litmus paper for acidity in water and its pH value. Step 3: Mix the tap water and dirt together. Step 4: Place cotton wool in the cap area. Step 5: Layer the bottle with activated carbon, gravel and sand. Step 6: Place the upside-down bottle over plastic cup. to filter through all the layers into the plastic cup. We thought that the natural materials would clean the water but not 100%, as there is no water like this, there is water that’s safe to drink but even that has some beneficial irons and metals. We thought the result would be around 90% clean, and we were right our water was fine once you put some lemon in it. Our results for our ph (potential of hydrogen) test was a 7 which is what you should aim for. Our results for the Nitrite test was 0.1 which is acceptable and safe to drink. Last but not least, the litmus test on the sample came out light blue which is good. We did the Litmus test on some balsamic vinegar and got orange which means that it was high in acidity. 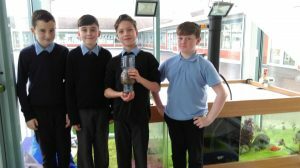 When we brought our filter into school where we were asked to test the water in the school fish tank. We used our filter to see how effective it was. 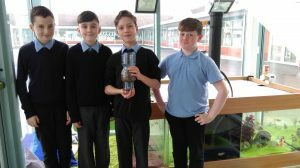 The answer was that it was really efficient; it helped the pH in the fish tank compared to the water without being filtered. 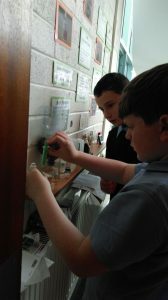 We have tested the fish tank water on a few occasions to see if the water is pure, some test results were lower while others were higher. It was pure enough for the fish to live in. Sometimes people from the other classes help with the fish tank. Though the water has been successfully filtered , and looks clean and pure , it does not taste as nice as fresh tap water. The filtering process seems to have affected its taste . However , a slice of lemon in the filtered water improves the taste .